Fashion and the red carpet have a symbiotic relationship. They simply cannot exist without one another so naturally since its awards season in B-Town our WHWN section is going to be busier than ever! Without further delay lets get judging with the first award function of the season: Colors Screen Awards! It looks like Ms Chhabria didn’t get the memo that this was an awards function… The dress is way too casual for the red carpet. No denying that she does look great, just out of place. Perhaps a one-sided hairdo highlighting that one shoulder design the dress endorsed could have made this outfit more red-carpet worthy. Whilst this would be a hot rating on any other day, for the red carpet I’m going for a not hot rating for Aarti. Whilst Ms. Patel knows her big brands and designers she doesn’t often wear them well. This look thankfully is an exception even though it’s nothing to rave about, its nothing that makes you shake your head in disappointment either. Less is always more and this beautiful flowy gown exhibits just that. Perhaps a fancier hair-do with more volume could have taken this look to a whole new level. For now Ameesha scores a quite hot on our ratings bar. I’m going to quite conveniently ignore the rather good-looking actor on Amy’s right who clearly has forgotten the location of his shaver and instead concentrate on the lady herself. What a striking outfit! She pulls it off and how! If only those tacky platform heels were ditched this would be a completely classy and hot outfit nonetheless Amy scores a Pretty-damn-hot for now. It really pains one to see a pretty girl get her fashion oh-so-wrong! There’s really no place to start with this one so all I can do for now is pray that Anjana gets herself a stylist PRONTO! Not Hot! 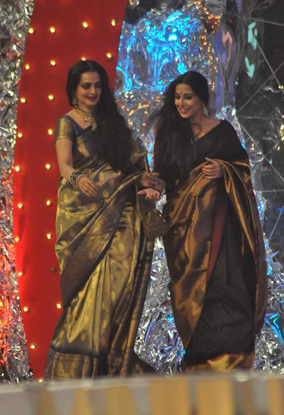 Rarely does Asin disappoint and this event was no different. The striking red lips compliments the cream gown perfectly making it a winning look all around! Perhaps if pressed to pick a flaw it would have to be the silver clutch which looks a tad bit out of place. Pretty-freakin’hot! I think we’re all still getting to know Ms Singh’s style statement. She’s never one to bore and tries out new things. Sadly for her it doesn’t always pan out such as this all-black look she opted for. The fabric itself screams ‘tacky’! More importantly in this photo, courtesy of the flash, the dress doesn’t highlight Chitragandha’s figure in the more favourable way. Add to that the icky shoe choice, the bland makeup and oversized earrings, this one was a disaster all around! NOT HOT! My favourite lady on the carpet for the night just has to be THE Ekta Kapoor who’s successful year was all too evident in her presence – attire, expression and all! Whilst I do think she had quite the style going in the past couple of months in her Malini Ramani dresses/kaftans, I’m so glad she ditched it for a more glamorous-do for the award show with this Manish Malhotra lehenga. Normally not a fan of a net dupatta worn in the manner it has been here but Ekta makes me even love that! Some may call it too festive for the red carpet, I say it’s the perfect festive attire for a night of celebrations for a producer who has had the year Ekta has had! Extremely Hot! There’s nothing quite as elegant as an Abu Jani and Sandeep Khosla outfit and what better place to wear one than an award function! Sonali definitely made the right choice with this beautiful net saree and velvet blouse. I really have nothing more to say except that she looks absolutely stunning! Too hot! 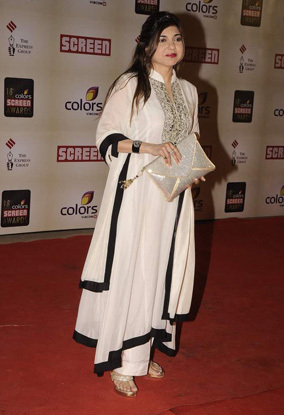 It was a simple white, black and gold salwar for Udita that she matched with black accessories and shoes. It was a refreshing break from the multi-layered and floor length anarkali everyone seems to be sporting these days. Once again we have a lady on the carpet who clearly understands the power of the express ‘less is more’. Very Hot! Well there you have it guys! The first of it is now over and we’re all warmed up for the many more awards to come. For the stars that dodged the bullet this time, don’t worry you’ll surely not be so lucky next time. It will be interesting to see the reappearing stars at award functions and just how innovative and impressive they keep their fashion on the red carpet throughout the season. Stay tuned to Bollyspice and we’ll be sure to keep you updated.